Formula D transports you into the turbulent world of Formula 1: Don't lose control of the engine in the last bottleneck, master the chicane, stick to your opponent's back wheels, take advantage of the slipstream and then coolly overtake him â€¦ A Formula 1 pilot has to be willing to take risks and be able to plan ahead - at least if you want to get to the very top of the winners' podium. Formula D also means the suspense of illegal racing on the streets of the big cities. Anything goes: customized cars, nitro fuel injection, skidding in roundabouts, unfair tricks â€¦ The game principles always stay the same, but different cars, rules and circuits come into play. 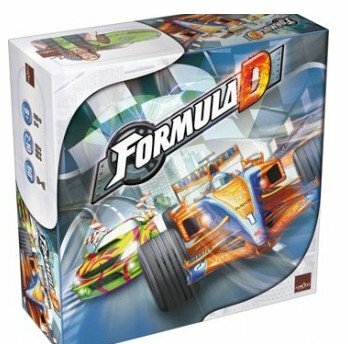 This new edition of Formula D contains material which has not yet been published, including painted cars, dashboards, driver profiles, circuits â€¦ And simple playing instructions are enclosed, allowing you to start play immediately. Off you go! 10 dashboards for the players. Other products in the "Formula D" series. Great multiplayer car racing game where you use dice to determine the gear you are in. the higher the gear the further the movement. be careful not to go to fast in the turns. you dont want to crash and blow up your car. Yes, there is some randomness and light-spiritedness to this racing classic, but the different "dice gears" add some tactics as well. It's fun, thematic, can incorporate up to 10 people, and if you keep it to a single race around the track, about an hour long to play. Add some extra gears dice (sold separately) to help speed things up a bit so that players don't have to grab as much at using one set of common dice. If you want to add more time and complexity there are several good thematic rules additions that add more realism to Formula 1 style races, and even more theme (and crazyness) with the street racing version, that features new car models from which to choose and varied characters with different "powers" and advantages/disadvantages to their cars. I prefer just the Formula One gameplay best, either with the basic or intermediate rules. While this is correctly categorized as a roll-and-move game, there is so much more to it than that. It's a blast trying to figure out how hard you can/should push your vehicle and what you can do to mitigate the consequences. The game plays fast and everyone who's ever driven a car can relate to the mechanics in some way. Very good game to own, especially since it plays up to 10! Leave it to Asmodee to take a bona fide classic and give it a fantastic upgrade. With new tracks, cooler painted cars, new street racing rules, and yet all of the classic gear-based roll and move action you're used to, you just try playing this game without making "VROOOOM" noises as your cars race around the track. Not possible.